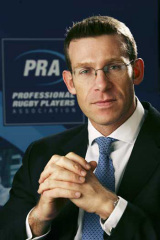 Damian Hopley is the chief executive of the Professional Rugby players Association (PRA). A former England international wing and centre, Hopley won three England caps along with a Sevens World Cup winner's medal and a Cambridge Blue. He played his club rugby for London Wasps between 1990 and 1998. He set up the PRA following a career ending series of knee injuries in order to protect the safety of players and ensure their success in future endeavours. Hopley's career ended at age 27 in 1998, leaving him bitter about the lack of support he received following his enforced retirement. In his position as CEO, Hopley takes charge of negations on all player related agreements on behalf of England and the British and Irish Lions. Hopley is also a board member of England Rugby Ltd, the company charged with supervising England rugby during the professional era. Hopley and the PRA ensure that the interests of professional player at all levels are maintained to the standards required during the professional era. The PRA is also a member group if the International Rugby Players Association, a coalition that is currently being chaired by Hopley. Hopley has become an increasingly important voice in the English game, especially considering the spate of "club v country" rows that have erupted in recent years.